e-NIOS is excited to participate in Bio-IT World, 16-18 April 2019, Boston. Join us at Seven Bridges’ booth #332 in the Exhibit Hall, for a demonstration of signature-based interpretation on the Seven Bridges Platform with BioInfoMiner! This is a new e-NIOS’ collaborative work on composite biomarker signatures, combining genomics with positron emission tomography (PET) measurements. The Athens Comprehensive Cancer Center (ACCC) was founded in 2017, in partnership with the German Cancer Research Center (DKFZ) (Heidelberg, Germany) and aims to position itself as the first comprehensive cancer center in Greece based on innovative strategies for precision oncology. A new paper involving the participation of e-NIOS and a BioInfoMiner-derived biomarker signature was published in the high impact journal Cell Metabolism. Dietary restriction was shown to impact on tumor growth with very variable effects depending on the cancer type. However, how dietary restriction limits cancer progression remains largely unknown. In this publication, we demonstrate that feeding mice a low-protein isocaloric diet but not a low-carbohydrate diet reduced tumor growth in three independent mouse cancer models. Surprisingly, this effect relies on anticancer immunosurveillance. 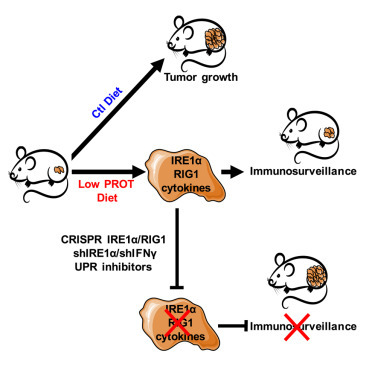 Mechanistically, we established that a low protein diet induces the unfolded protein response (UPR) in tumor cells through the activation of IRE1α and RIG1 signaling, thereby resulting in cytokine production and mounting an efficient anticancer immune response. A joint project between e-NIOS and Genosalut genomics company is among the 25 best-ranked projects funded by a PERMIDES Innovation Voucher. The project, entitled “Prioritization and pathway Analysis by MachinE LeArning”, aims at the development of an innovative precision medicine application, which integrates clinical and computational expertise, as a decision support tool for diagnosis and treatment of complex diseases. e-NIOS will be joining soon another international interdisciplinary research network (Greece, Ireland, France, Switzerland, Turkey), which will bring together experts in the fields of immunology, cancer cell biology, systems biology and pre-clinical drug development, in order to investigate tumour – immune cell interactions for the development of new cancer therapies. e-NIOS is a partner of the “INNOCENT” consortium (Slovakia, Greece, Norway, Spain, Latvia, ), funded by a EuroNanoMed II ERA-NET grant, aiming at the development of innovative multifunctional nanopharmaceuticals for breast cancer treatment, with emphasis on cancer stem cells.